Sign denoting that the value on the left is of greater magnitude than the number that follows. Sign denoting that the result of an operation is equal to or of greater magnitude than the number that follows. Sign denoting that the value on the left is of smaller magnitude than the number that follows. Sign denoting that the result of an operation is equal to or of smaller magnitude than the number that follows. Sign denoting that the number that follows denotes an order of magnitude. Binary sign denoting that the result of the operation noted on the left has the same value as the operation noted on the right. Binary sign denoting that the result of the operation noted on the left does not have the same value as the operation noted on the right. Sign denoting the result of an operation. Sign denoting that the result of an operation is not close to the same value as the one on the right. Sign denoting that the result of an operation is close to the same value as the one on the right. Sign denoting that the value on the left is the same magnitude as the one on the right. Sign denoting a number (dividend) is to be divided by another (divisor); the result is a quotient. 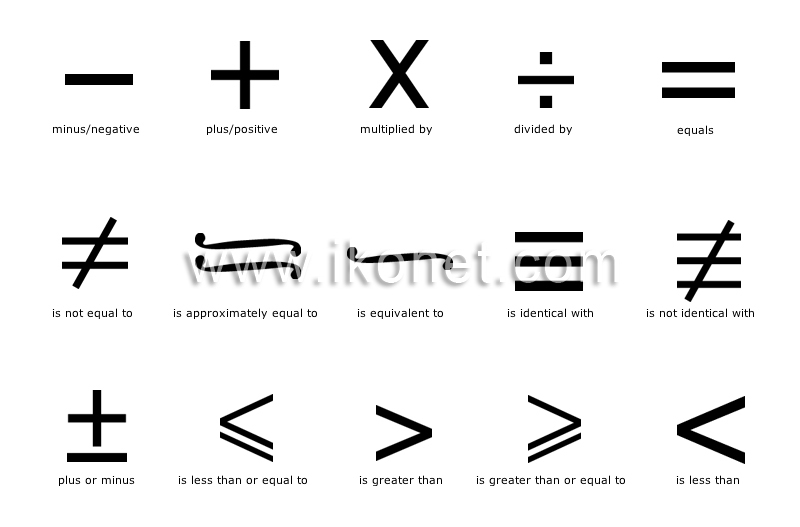 Sign denoting that a number is to be multiplied by another; the result is a product. Sign denoting that a number is to be subtracted from another; the result is a difference. Sign denoting that a number is to be added to another; the result is a sum.